Previously I’ve done simulations, based on VIX futures, of volatility Exchange Traded Products (ETPs) back to 2004. In these simulations, I only generated the closing values, but since then I’ve had requests for open/high / low (OHL) values. 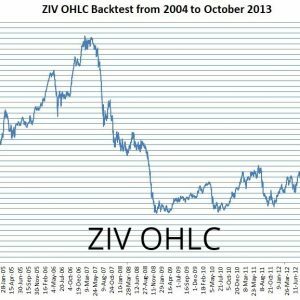 I’ve extended my backtests to generate ETP opening and intraday highs and lows for many of the short and medium term volatility funds—specifically VXX, VIXY, TVIX, UVXY, XIV, SVXY, VXZ, and ZIV, in addition to the closing values. Most of these open/high /low simulations cover from March 2004 through 25-October-2013 for reasons that are explained below. 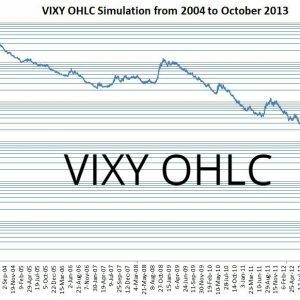 For most of these funds there is publically available OHLC data from that point forward, however, ProShare’s leverage changes on UVXY & SVXY after the events of 5-February-18 created a situation where the publically available historical data on those funds is a mix of the new and old leverage funds. Most importantly the trade data on the 1.5X UVXY and -0.5X SVXY is only available from 28-Feb-2018 on. 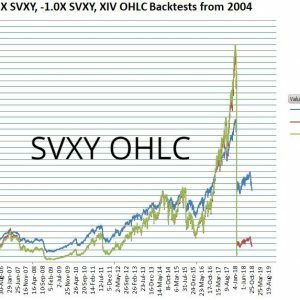 To address this lack I simulated 1.5X UVXY and -0.5X SVXY open/high/low/close values back to March of 2004 and included that data up through 29-March-2018. 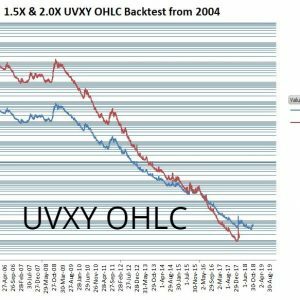 I’ve also included the OHLC data for the 2X and -1.X versions of UVXY and SVXY from March 2004 until their leverage changed on 28-February-2018. 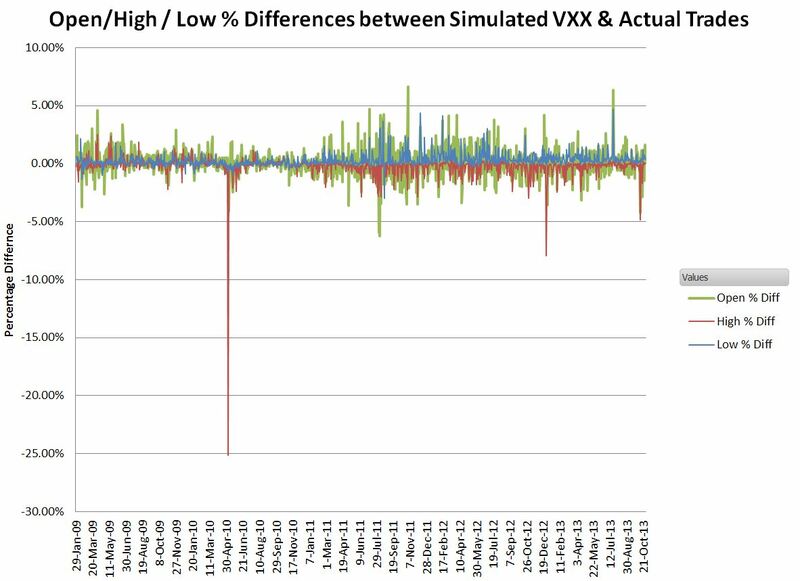 The volatility ETPs (complete list of USA funds) are all based on two or more sets of VIX futures. The CBOE provides historical open/high/low/close/settlement values for these futures starting in March 2004. 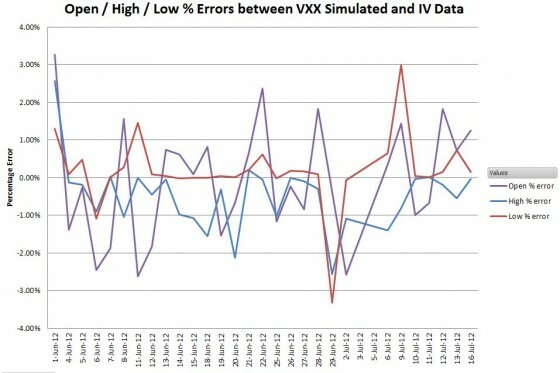 Since the indicative values (IV) of the volatility ETPs are directly tied to these futures, the futures’ opening values can be used to accurately compute the ETP’s opening values—as long as the VIX futures and ETPs start trading at the same time of day. This was the case until December 10th, 2010 when the CBOE starting shifting the opening times of VIX futures—more on this later. The ETP intraday high/low values can also be calculated using the appropriate VIX futures intraday values but one additional assumption must be made—that the futures hit their intraday highs and lows at the same time. I didn’t expect that assumption to introduce a huge amount of error with the simulated values, but I wanted to verify that by comparing my simulation results to actual data. 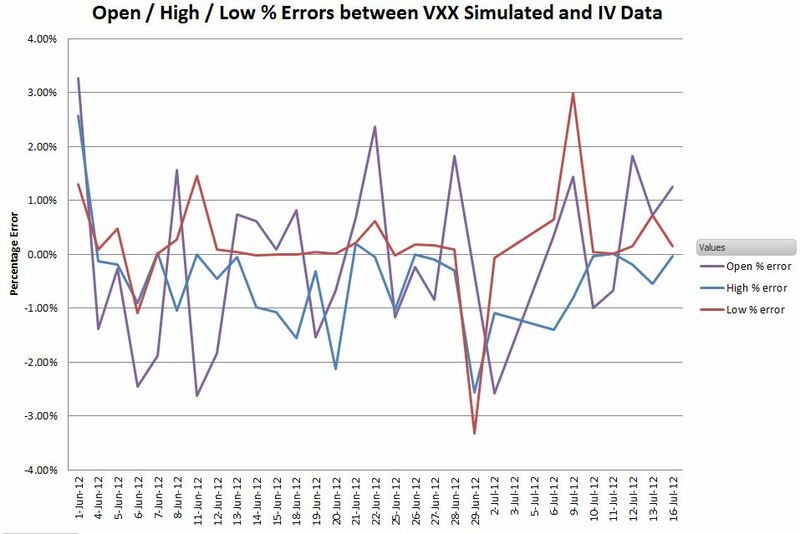 To evaluate the magnitude of these errors I used O/H/L indicative value data from Barclays’ VXX short term volatility fund from June 1st, 2012 through July 16th, 2012. I would have preferred pre-December 2010 data, but I don’t have access to intraday IV data that goes that far back. A chart showing the relative percentage error is shown below. Considering the uncertainties, worst cases errors in the +-3% range seem reasonable. Sixty-five percent of the data points had errors less than 1%. Six values had errors less than 0.01%, which suggests to me that my methodology is correct. 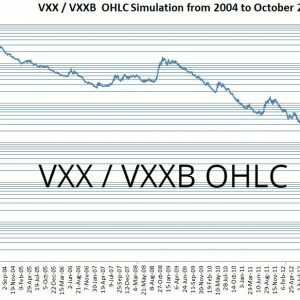 The next chart shows the differences between the actual trades (not the IV values) and simulated O/H/L values for VXX, starting January 30, 2009. This chart illustrates a couple of additional difference terms that emerge when comparing the IV values to real trade data. First of all, there’s no guarantee that a trade will occur coincident with the open, close, or intraday highs/lows of the ETP’s IV. For example, the big -25% dip for the highs occurred on 6-May-2010—the Flash Crash. It’s not surprising that no one traded at the indicative intraday high of 42.13 (open was at 23.34!). Other differences come from bid/ask spreads and tracking errors. 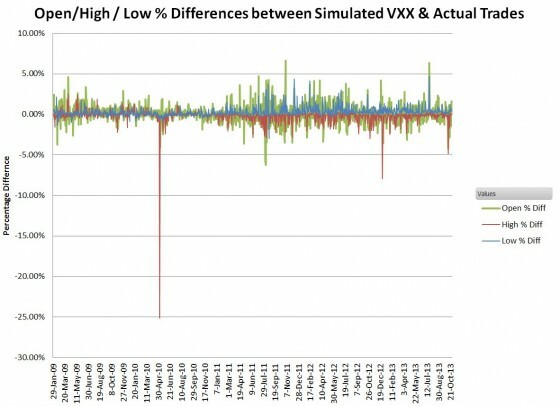 The indicative value is computed from real-time VIX futures values and updated every 15 seconds, but volatility fund market makers are not obliged to trade at that value. Unless the fund is heavily traded the spread between the bid and ask price will be at least several cents and if demand is unbalanced on the buy or sell side the offered spread values may be significantly different from the IV value. This next chart zooms into the +-5% portion of the chart. 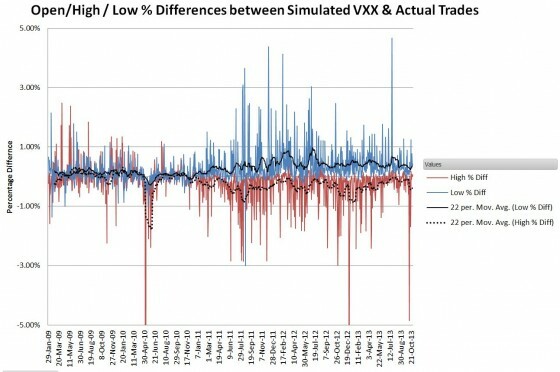 The 22 trading day moving averages show the impact of the CBOE’s shift in the open time starting in December 2010—the average difference between the simulated IV values and trade data moves from close to zero to somewhere between +-0.5% and +-1.0%. 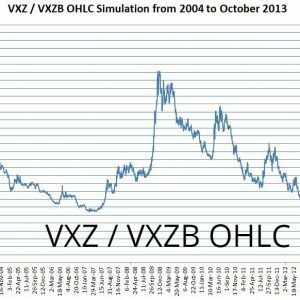 I cut off the O/H/L simulation on the 25th of October, 2013 because on the 28th the CBOE changed the Tuesday through Friday opening times to 4:30 PM the previous day. This change was in preparation for the eventual move to nearly 24-hour VIX future trading which began June 2014. This change meant that the VIX futures were trading many hours before the volatility ETPs began trading—making VIX futures an unreliable proxy for ETP open/high/low levels. The close time, 4:15 PM ET, has remained consistent, so VIX futures can still be used to compute ETP closing values. I verified with the CBOE that the historic VIX futures data published on its website tracks the shifted opening times and is no longer synchronized with the ETP trading times. 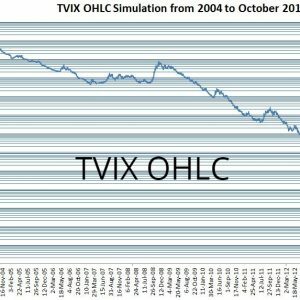 In the case of my simulations, there’s really no harm, because their primary value lies in predicting what the ETP’s O/H/L values would have been from March 29th 2004 until the various volatility funds started trading. 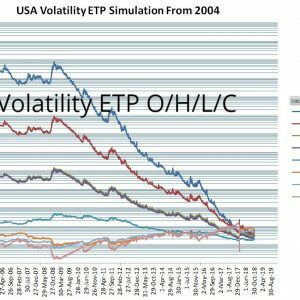 Actual trade O/H/L values exist for short term volatility ETP types (1X, 2X, -1X) prior to the 10-Dec-2010 shift in VIX trading hours. For more information on my ETP O/H/L/C simulation spreadsheet see this readme. The spreadsheet includes the formulas that convert from various indexes (e.g., similar to SPVXSTR, etc.) to the IV values, but it does not include the VIX futures values or the index calculation formulas. If you purchase the spreadsheet you will be directed to PayPal where you can pay via your PayPal account or a credit card. Please email me at [email protected] if you have problems, questions, or requests.